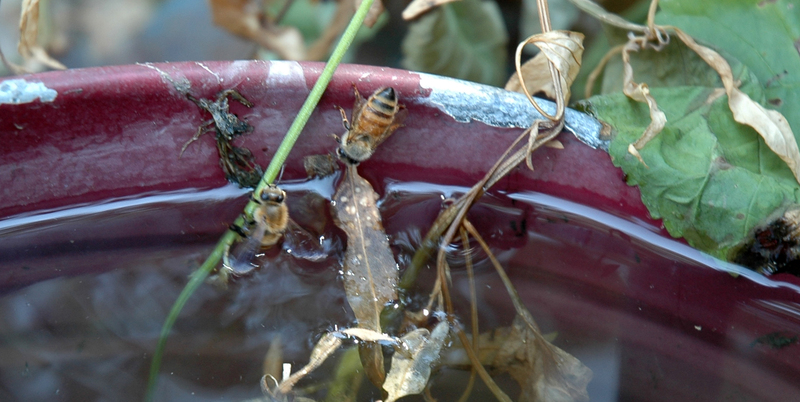 Dairy = Daisy and the Bees are Swimming. This is not my barn. It is an empty barn down the road. It is waiting for a cow. It has been waiting for a long time. A sleeping beauty. We have many abandoned barns around here. I decided to buy Daisy because she was pretty, had big brown eyes and long, long legs. 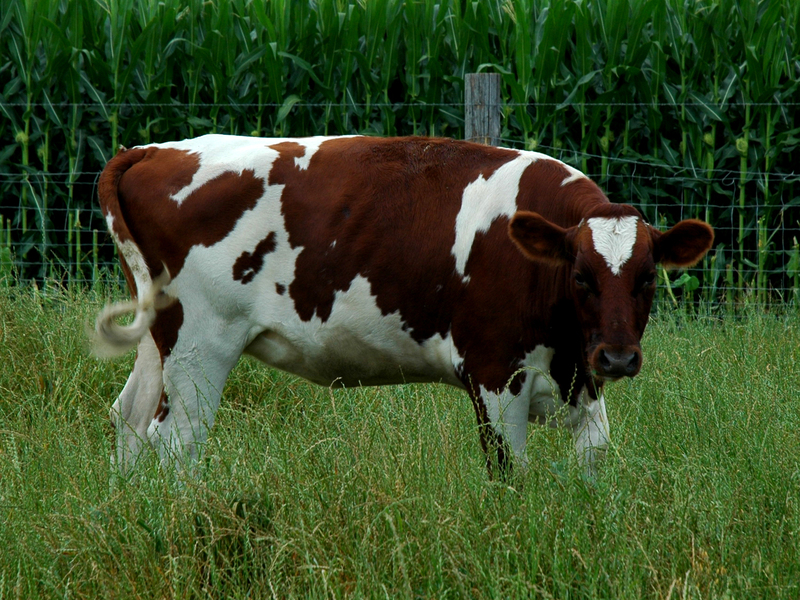 Also she was an Ayrshire, a breed of Scottish origin, known for its ability to give good creamy milk on forage. I want to make my own tasty cheese and butter and drink my own milk. I cannot support those big dairy farms where the cows never even SEE grass standing on their carousels and being milked three times a day. So we needed our own gentle pasture raised milk cow. We decided not to feed her or our beef cows bulk feed field corn. They may have sweetcorn grown on our land in the season but only if they eat their greens first! Corn is too acidic for a cows stomach. They cannot digest it. And yes most of the industrially grown field corn is genetically modified. (Here she goes again). Also as it has been engineered for maximum yield per acre the corn has lost a frightening amount of protein over the last few years, this has been replaced by starchy sugars. ie fat, sick cows. So we decided – no field corn for our cows. Which means we needs lots and lots of grass and hay. Here is baby Daisy at 5 days old. So sweet.. look at her skinny wee legs. Now leap forward Two years and this is Daisy this morning. As I got the shot she galloped straight at me and skidded to a stop just short of my head. Like some cartoon cow, you can almost hear the pretend screeching and skidding sounds. She was probably making them under her breath. You know how cows are! She does this all the time trying to scare an apple up out of my pockets! She still is a cute cow though. Big and tall. She is a nuzzly cow. Always looking for treats. Beautiful big healthy grass-fed cow. I am hoping that she is pregnant too. A few weeks ago she had a visit from the vet. We are hoping for a virgin birth in March. The vet will visit in a few weeks to see if she is enciente. So stay tuned. So we have chickens, cows (one dairy cow, one beef heifer and one beef steer) and the sheep, ( Mama and her progeny – Mia and the two Murphys who are destined for christmas dinners – and Hairy MacLairy the ram) All of whom eat a variety of grasses and legumes and forbes ( a fancy name for weeds! Don’t you love it). When you get down to it we are grass farmers. Weed farmers. Worm growers. Lovely. An important element of a sustainable outfit is diversity, both animals and plants, so that one metaphorically and sometimes literally feeds the other. It is all intertwined. As long as you are growing what grows naturally. But everything depends on the ground. The ground we walk on. The earth from which all things should grow. The fundamental building block of a good property is good SOIL. The other reason for having cows is that cows are brilliant players in the game of soil health. As long as they have access to good food they give the good straight back, with a big plop. Cows merrily drop all the components for good soil all over the fields all day long, and then lift their tails and water it in! Later my feathered manure spreaders peck at the manure and scatter it all about and drop a bit of their own in there as well. After a few years of this all those lovely worms, and soil creatures (I am desperate to see a dung beetle or a mole – both of whom are great signs of soil health) and most especially those micro organisms that promote soil and plant health, will return. It will take some time though. I am trying to be patient. We love to see people catch the self-sufficiency, sustainably managed, small holding, lifestyle block, homesteading, getting back to nature, whatever you want to call it, bug. 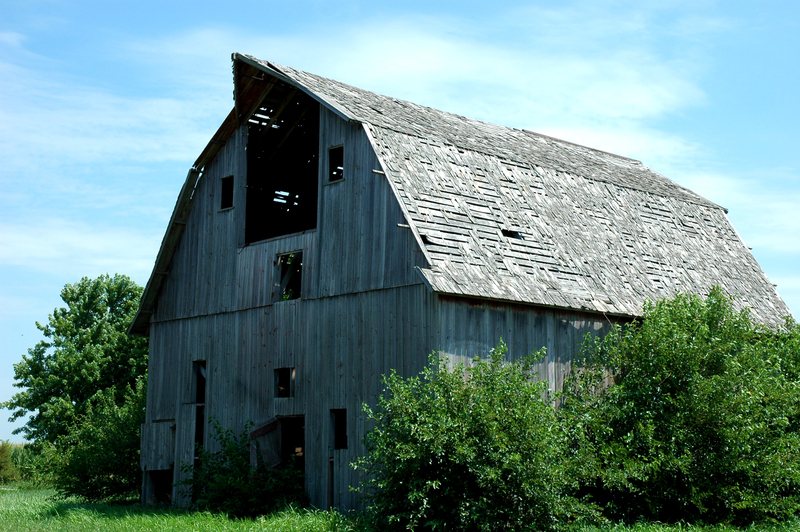 Save the Barns. Feed themselves. Mitigate the destructive monoculture industrial growing. Go and find an old house with a broken down barn and three or four acres and get out a hammer and a shovel and a dog and start making a go of it. It can be done and it is immensely satisfying. Instantly satisfying. But GO SLOW. Do not overstock. If you overstock you are becoming like THEM! Have more grass than you need. Plan for your lambs and calves to be born outside when you have lots of grass and before the flies. Milk during the summer. Fatten your pig on your milk. Plant a fattening field to fatten lambs and steers in the late summer. Take your stock to the abattoir when the grass starts to die off. Plan according to your climate. It is all so sensible really this way. Plant your flowers and trees every year and make sure you sit on your verandah and admire them every evening. It is about living the life. The easy way. There is no destination. We are not going to get rich. We just want to live like rich people, eating good food. Here is the barn my new neighbours, who are retiring from the city, are fixing up. I will keep you updated. Because it can be done, he said. He is also rebuilding the old house and his wife is having air conditioning no matter what! She cannot believe that I refuse to turn our air on. Well, I have a chook standing around in the chook house just not looking happy. I cannot see anything wrong with her except for this lethargy and loss of appetite. I will isolate her in the hospital wing ( an old dog crate in the run) Then I will dose her and the whole flock with extra garlic, and yoghurt and thyme (I just mix it with their food) .. then I will give the same to the cows and the sheep. Twice a day for a few days actually. All water barrels will be emptied scrubbed and refilled fresh with cider vinegar in them, just to be sure. It may just be the heat. Bit of a bore but there you are. Speaking of water. i popped outside to get your last shot of the day: Look! The thing about raising animals and plants and bees using sensible organic methods is to pay attention and ignore nothing. Observe. 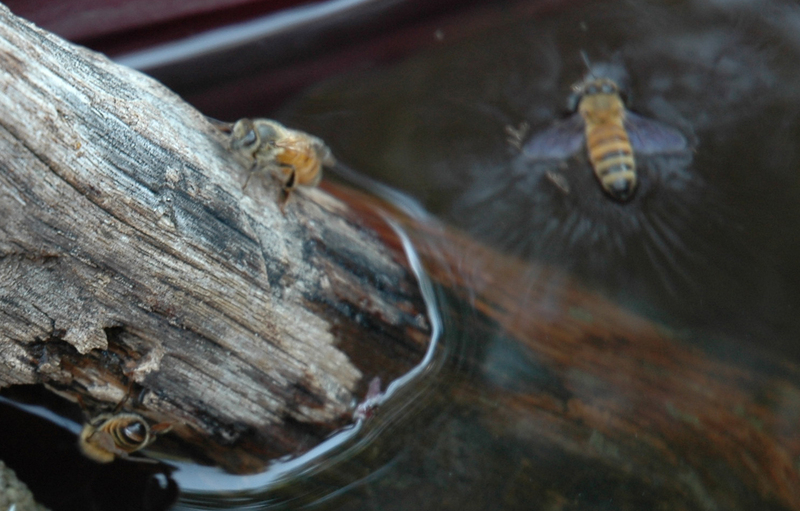 Did you just see a bee swimming? This is brilliant we are loving it, even jacob is reading it when i drag him to the screen. It is motivating me to get outside and get busy when I can. Dug the vege garden over the other day iin preparation. I am loving that you are reading.. really.. isn’t it time to plant your onions and garlic. out there in NZ.. .close to the shortest day and all that? I’m so glad you linked to this post. I hadn’t discovered you at this point last year, and look what I missed! Aww I thought Daisy was cute before! She was just darling as a calf! Not a lot has changed except some extra meat on her! By chooks I take it you mean chickens? I don’t know a lot about the specific names in farm life hehe. In NZ we call chickens chooks. What’s for dinner.. chook! you are probably already learning how to speak Noo Zild! Awwww. 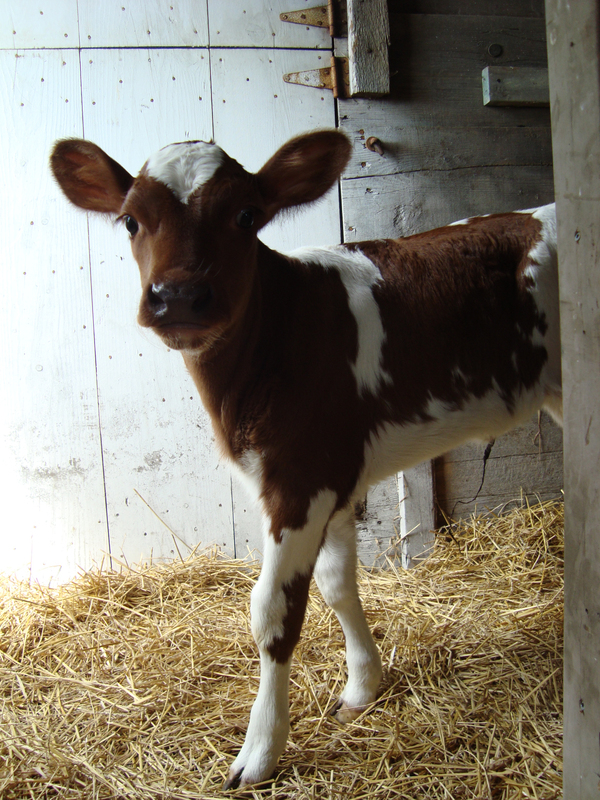 Baby Daisy…I just can’t believe that’s the same cow!